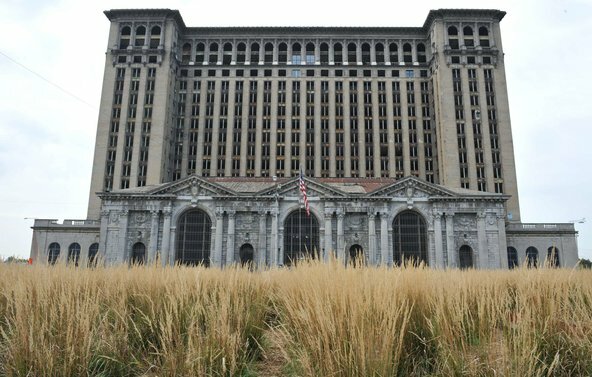 Under the so-called grand bargain, foundations, the state of Michigan, the Detroit Institute of Arts and even the city’s water and sewer system have pledged hundreds of millions of dollars to bolster the municipal pension system and give the art collection new, bankruptcy-proof ownership. In return, retired workers accepted reductions to their monthly checks and other cutbacks. If all goes as planned, the grand bargain will keep the retirees’ reduced pension checks coming for the rest of their lives. But the pension system that the settlement leaves behind has some of the same problems that plunged the city into crisis in the first place — fundamental problems that could also trip up other local governments in the coming years. Like many other public systems, it relies on a funding formula that lags the true cost of the pensions, and is predicated on a forecast investment return that the judge, Steven W. Rhodes, himself sharply questioned during the trial on Detroit’s bankruptcy plan. Moreover, if Detroit finds itself confronting another fiscal crisis in the near future, it can no longer tap the museum’s art collection, which many saw as its top asset. These risks might not matter if Detroit’s pension obligations were just a marginal part of the city’s finances. But they are not. Even after the benefit cuts, the city’s 32,000 current and future retirees are entitled to pensions worth more than $500 million a year — more than twice the city’s annual municipal income-tax receipts in recent years. Contributions to the system will not be nearly enough to cover these payouts, so success depends on strong, consistent investment returns, averaging at least 6.75 percent a year for the next 10 years. Any shortfall will have to ultimately be covered by the taxpayers. 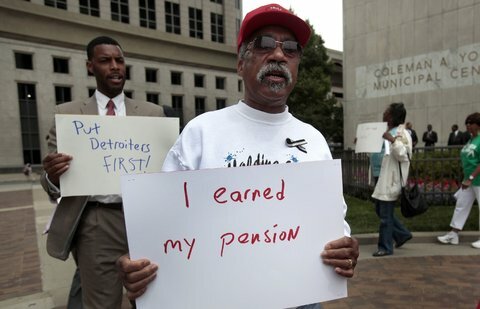 Documents filed with his court show that Detroit plans to continue its past practice of making undersize pension contributions in the near term while promising to ramp them up in the future. This approach is by no means unusual; many other cities and states do it, on the advice of their actuaries. Detroit’s pension fund for general city workers, now said to be 74 percent funded, is scheduled to go into a controlled decline to just 65 percent by 2043; the police and firefighters’ fund will slide to 78 percent from 87 percent. After that, the city’s contributions are scheduled to come roaring back, bringing the plan up to 100 percent funding by 2053. This will work, of course, as long as the city has recovered sufficiently by then. The state’s contribution to the grand bargain lasts until 2023, with the foundations and the art museum continuing to kick in until 2033. Eventually the payouts will begin to shrink some as current retirees fall off the rolls. Active workers have already shifted to a hybrid pension plan, and they will start to bear most of the new plan’s investment risk. But the city faces decades of payments for retirees under the old plan. “The city has the potential to be saddled with an underfunded pension plan,” warned Martha E.M. Kopacz, the independent fiscal expert Judge Rhodes hired to help him determine whether Detroit’s exit strategy was feasible. Ms. Kopacz, a senior managing director with Phoenix Management Services, did find it feasible, but expressed many reservations, especially about pensions. “The city must be continually mindful that a root cause of the financial troubles it now experiences is the failure to properly address future pension obligations,” she said in her report. Judge Rhodes said on Friday that he agreed. Pension concerns in Detroit coincide with a high-level debate among actuaries about their standards for funding public pensions and whether the public is adequately protected from more bankruptcies and Detroit-style disasters. The widespread practice of lowballing pension contributions today so that people will pay more down the road comes from the actuarial standards of practice. All those eye-glazing board meetings, the bewildering calculations, the talk of “required contributions” and research on whether cities are paying them or not — those things have apparently confused the public into thinking that as long as an actuary follows the standards, and a city or state follows the actuary’s advice, a solvent public pension system will be the result. Not so. To make his point, Mr. Cramer cited two popular actuarial methods, used in Detroit until now and still in many other places: “rolling amortization,” which pushes costs endlessly into the future, and pension contributions calculated as a percentage of an assumed rising payroll, which “backloads” the funding. Those methods “do not pay down principal,” Mr. Cramer wrote. That means they can work the same way interest-only mortgages with low teaser rates did in the subprime crisis: They can allow the growth of invisible debt, which, if not understood and managed carefully, can snowball and harm unsuspecting people. The actuarial standards of practice also permit the use of investment forecasts to discount future benefit payments into today’s dollars. Virtually all states and local bodies of government use investment assumptions this way; it makes their pension obligations look more modest and affordable than the true economic cost. The Securities and Exchange Commission bars private companies from reporting their pension liabilities that way, but it has little power over cities and states. Mr. Cramer’s letter followed recommendations issued in February by a panel of experts and presented to the Actuarial Standards Board. The board is now gathering opinions on whether to revise its standards for public pensions; all comment letters are due by this weekend. Reactions so far have ranged widely, with some arguing that the changes would be costly and unnecessary and might confuse the public even more. One favorable comment letter came from James Palermo, a trustee of the village of La Grange, Ill., who said better actuarial standards would help shake “a ‘trust the expert’ mind-set” that can backfire. La Grange was one of a number of Illinois communities that had to raise taxes this year after discovering that their actuary was using an old mortality table that underestimated their police officers’ life spans, making skimpy pension contributions seem adequate. In Detroit, the lawyer now suing the actuaries, Gerard Mantese, said he thought a faulty mortality table was also part of the problem. Judge Rhodes said on Friday that the state would have to serve a tougher pension watchdog role. Michigan is putting $195 million into the grand-bargain pot, and in exchange Detroit’s retirees are releasing the state from any liability under its constitutional clause barring public pension cuts. Judge Rhodes said he found that settlement reasonable, but he made his misgivings clear. A version of this article appears in print on 11/12/2014, on page B1 of the NewYork edition with the headline: Bankruptcy Over, Detroit Still Skirts Insolvency. Posted on November 12, 2014, in Postings. Bookmark the permalink. Leave a comment.